It finally feels good to be in a position - thanks to smart technology, FB communication and a search for 'rare hard to find doing humanitarian young leaders' we have provided Lombok (5 million pop) a first ever volunteer driven foundation, the ability to connect the poorest of the poor kids and adults to hospitals, surgeries and limited prosthetic aids. We are a foundation that has grown without funds but this has made us strong - smart and savvy. We have seeded and sparked a movement of hundreds of social working volunteers, growing new arms in different regions and also sparking new startups and new foundations. Because of necessity together we have grown into the most amazing network, collaborations, govt support & we have members of police that represent us in all provinces and daily these people are working helping forgotten, sick, disabled and poor. But it hasn't been easy but it has grown virally with always so much to do - resources and funds are few. Our teams endless stories, group surgeries of 70 cleft lip children a time, sadnesses and successes are so many now that keeping up with it all is watching a moving organism, reporting to message groups of so many people helped every day. Our specialty now is finding & growing new humanitarian leaders, teams and teams of teams - mostly of young people many disabled or experienced sickness themselves, all who together who are growing a kinder Indonesia. Being a doing foundation our voice and purpose is now reaching millions, daily we are on radio, newspaper and even TV channels both local and national have found us through our work. Endri has done 25 minute documentaries to audiences of 50 million + on Indonesia's Opra type shows and also well awarded. We were national winners in a country of 240 million people of "using technology to help the poor" in an award that we did not even apply for. Our human capital 'people empowering tools' now include eight LFC foundation bases (we own 2 out right) as we move to remote Flores we will soon build another fondation base and others. To empower our poorest volunteers we have 9 motorbikes busily visiting sick, we have 2 hospital vans going non stop and a specially built disabled sidecar for our disabled disability manager Wisnu. Our simple secret has been our ability to Prioritise and to implement action. We are so proud of our teams, it is all so exciting but so very sad also ... thank you all so much Peter Honey .. In modern countries all the above would face some sort of criminal or legislative action, or from the public questioning the role of all the above not acting out their roles of responsibility. FINANCIAL VICTIMS: More than half of the children we help are financial victims where as most charities support ‘financial victims’ - even our abandoned blind orphans are ’well off’ as these children have care givers and are ‘in the system’ … the ABANDONED VICTIMS have no one, no one who loves them or who are prepared to fight for them! Lombok Forgotten Children is a registered start up foundation to ‘firstly’ to FIGHT FOR ABANDONED CHILD - assist chronically abandoned disabled, & to drives and encourage the Indonesian Government & People to pick up the responsibility in being 21st century citizens. ​Dear Visitor, Our above information video is a great way to understand how we achieve so much with so little, please take the time to watch this if you are interested in helping. ​Our point of difference is that we do significantly big things with little money thanks to technology. In our first 11 months we have connected children to more than half a million dollars in aid, surgeries, legs, arms, wheelchairs using less than $20,000. We treat donations wisely & will grow the aid value of your donation significantly. Dear Visitor - We are very proud of Endri. Endri simply faces a situation where a whole province of 4.1 million people have been doing very little for their impoverished sick and disabled. There is a three generation backlog of sadness & need. 1) A car with annual maintenance- insurance costs covered. 2) Sustainable Wages for Endri's staff @$25 per week + $25 per week in field operating costs. 3) Smart phones .. this whole foundation has been built on smartphones & pads. & sharing with both myself & Endri some of the most moving experiences in our lives. 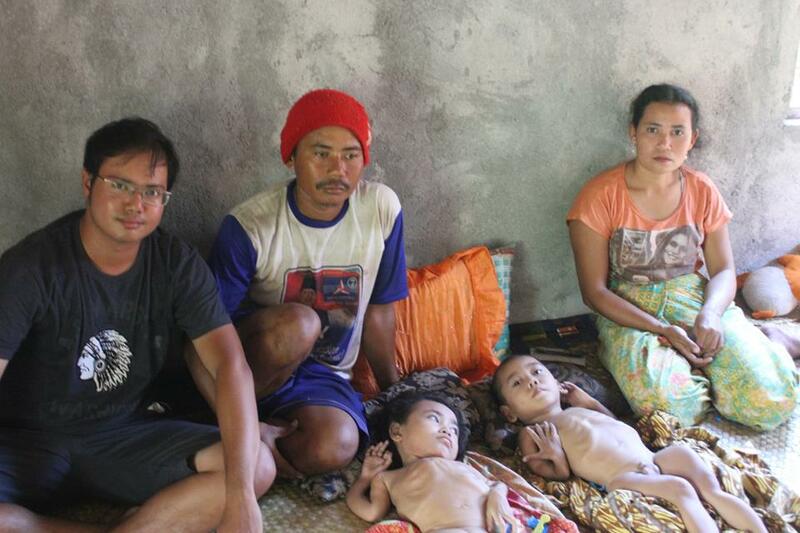 Lombok has some horrific forgotten children cases and this group's purpose is to 1) assist 'Endri' with his dream to start up Lombok's first NGO Child Humanitarian Foundation and 2) to help seed a western 'Lombok Solemen ‘Lombok Hospice & Disabled Children's Support Centre’ foundation. 1. 100% of Your Donation Goes to the Children: most charities charge up their staff time & operating costs against the project, these amounts can become a significant portions of donor funding for a project and donors end up paying for office rent, office staff, vehicle and even private accom & swimming pools in some charity organisations. Endri is separately funded so none of his costs are charged to projects. 2. How does Endri's Costs Get Covered? : Presently Endri gets paid US $38.30 per week plus US 38.30 for petrol & expenses. These costs get paid for by a private funder but we need a second funder for $30 per week for a employee for Endri. ​Peter Honey: Project Start Up Manager - Peter works totally for free and both him and wife cover most of the day to day charges - website etc No expenses ever are claimed for flights from NZ . 100% project money goes to causes. 3. How is so much achieved with so little? We have almost zero operating costs, also many people in our group raise money, donate time & resources for free. Also a big part of our function is simply in connecting the sick children to specialist charities and to do paper work & open government doors for victims to get surgeries. 4. Are We Sustainable? 2015 where are we going. No we are not sustainable yet, LFC has simply been formed because no one was doing anything to help. Our direction for 2015 is to have Endri get Charitable status and have the Bali's very Experienced 'Solemen Foundation' to set up a Solemen Lombok base together with support from Tim & Adam from Asia Prospects. LFC is a very young start up project with a new very Facebook Humanitarian Concept. We get things done & amazingly with others we save lives and we do it by CONNECTING. We have a tight group & have strong plan with aspirations to grow into a real organisation & then foundation or to be part of a big brother foundation. Endri is a young Indonesian man who we will be entrusting to get more than 100% of our donations to 'his peoples' sick children. He is a rare find, a trustworthy man from humble fishing village beginnings & who like us will work for free. He is degree trained, technology understanding, worked overseas, he is the 'elections oversea' & a leader who seeks a better world for his poor people. How & Why 'Lombok Forgotten Children'? THE PROBLEM - NO ONE IS DOING ANYTHING TO HELP! It all started with one little girl called 'Pira who needed legs' and it is now spiralling into a huge 'Forgotten Children' issue. We are only at the very early stages & sadly starting to uncover what looks like children in the hundreds. Many are in great pain, hungry, without mothers or fathers and have never seen doctors. The numbers are huge & are too big & too expensive a problem to pass onto the Bali Western Foundations that offer help, also the Lombok hospitals presently can't help (Yet) or are not skilled to help. The situation is so big that 'Indonesia helping Indonesia' is the only sustainable solution and it is extremely urgent that we support Endri to document all the children so as to provide the information to correctly present to central & local governments, in a positive way that encourages them to support the children without shaming them. 1b. Locating & Documenting the Children: The numbers of children are simply too big for any instant miracle answer, and to get some significant help for these kids it is important that the documentation is put together quickly so that it can be presented to local & central government. The children's access to hospitals is often due to no birth certificates, or marriage certificates, some of our remote village cases the victims don't even speak Indonesian. Donate: $1 per day here. 3. Attracting Endri is not arranging operations for these Children: We seek to organise second tier of coordinators whose goal is connecting as many sick children to hospitals & specialist foundations & surgeons. This is a huge job in itself and the logistics in simply moving some of these cases from village to hospitals is extremely difficult. The documentation will help this group. When the documentation is finished I welcome anyone to contact me who may like to help connect a child to a specialist or fund doctor support. Today Wed 13th Aug, Arif came to us on Face book for help. WANTED: Lombok Forgotten Child Guardian's. THIS YEARS SIMPLE GOAL: NO LOMBOK CHILD SHOULD DIE HUNGRY OR IN PAIN. Our Goal is to do a 1 year trial connecting 100% of 'food funders donations to desperately sick poor Lombok children on a monthly basis. 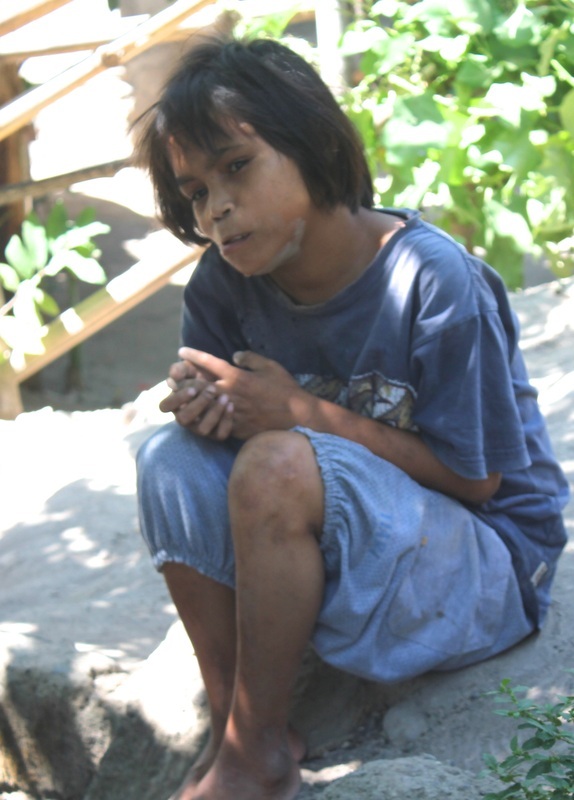 $1 per day will provide a monthly food and support packages to 50 hungry children on a 1 year trial bases. As soon as we can we plan to match each child to a donor and use a face book feedback system with photos as a way to show you how important your funding is and how grateful the families are. 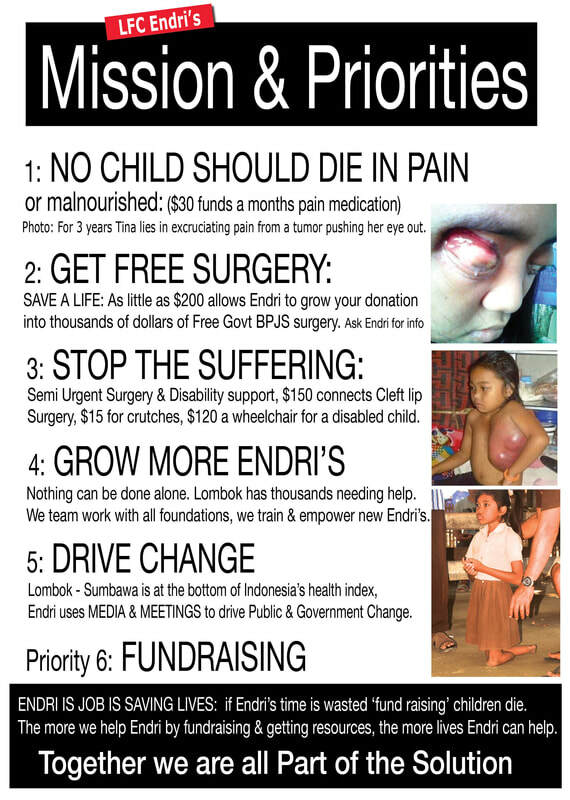 $50 Sponsor for Endri: Importantly we will soon seek $50 per week corporate sponsor to cover Endri's expences, can leave his job as elections oversea & focus 100% on ensuring hundreds of Lombok kids don't die hungry or in pain. Operations & Doctors: Lastly one by one we will get these children to doctors & medical help, if you would like to help a particular child please contact me. Please face book me direct regarding anything. How Endri doubles your donation - Endri Gets It! Donor's are hard to find special & generous people. Most of us are not rich, but have a strong sense of responsibility to help sick & desperate people. Un - like other Indonesian non-profit projects, Endri demands that his people work with him as un paid volunteers and he is also well connected to business people who also want to assist. Some donate the use of their vehicles once a month while other food businesses will double the value of our 'Donor's food & assistance packages. Local Government also have assist funding to help Endri. Trust & Feedback: Possibly the most important attribute Endri has is he understands the importance in earning TRUST from donors. To do this we will help Endri in creating 'real time feed back' with Donors using Face book as a platform to connect information, photo's and importantly the chance for families to thank donors directly and show their progress. Giving Hope & belief, a powerful medicine: Your donation is one great thing. But possibly what is even more powerful and stronger medicine for these families in despair, is a new connection to hope & belief. Your connection provided by Endri also gives him strength & energy to help - this gives him belief & the ability to deliver hope and solve problems in an amazing way. BEFORE: Pira with a family in despair. AFTER: Pira walks thanks to hundreds of good people. HOW ONE LITTLE HANDICAP GIRL LIFTED THE SPIRIT OF A COMMUNITY IN DESPAIR. Example 1: Sometimes preying is not enough and God likes us to be doing also. At 2 yrs once healthy Pira was in a bus that rolled killing one child tearing off Pira's legs. For 9 years her father dreamed of help for Pira who was the brightest in her school & dreamed to be a doctor. I met Pira at Sumbawa & promised to help - in 4 days I made a video, website, and with friends (mark Baldwin, Michael John, Stacee Harris) who set up a go fund me account and emailed some quality Indonesian foundations. We quickly connected with and amazing man, Mr John Fawcett and he agreed to drive the project but needed some funding help which the team set about doing. When Pira had to leave her village for her operations the whole town went to see her off at the car ferry. From this some big tourism introductions have been created and the town is making new plans with humble & realistic dreams.